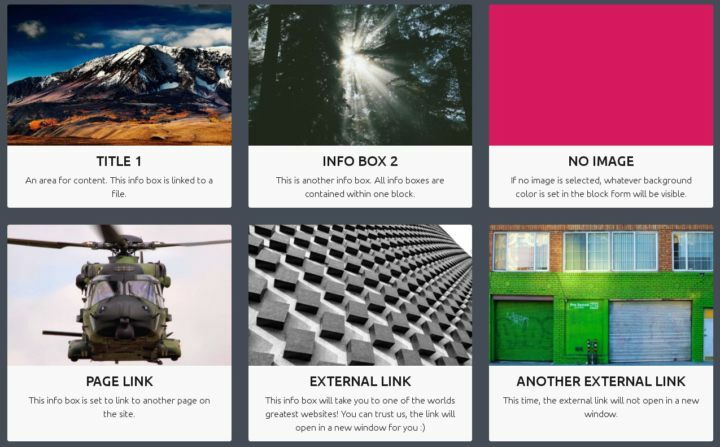 Info Box Grid is a block for adding multiple "Info Boxes" from one area that automatically lay themselves out beautifully. An Info Box is an element that contains a title, some content, and an image. It's a very commonly used element in web design. When you have multiple info boxes next to each other, and the content from one is higher than the other, it causes the layout to look broken. Info Box Grid fixes that by automatically adjusting the height of all info boxes to match each other.